Today is the 12th day of Christmas (well, the countdown to the day is beginning) and I've challenged myself to make 12 days' worth of cookies to share with my friends and family. In the original song, "on the twelfth day of Christmas, my true love gave to me... twelve drummers drumming..."
And instead of all that noise, I'm opting to give gingerbread biscotti instead. I've based the flavors off the classic German pfeffernüsse, which means "pepper nuts". The traditional cookie is made with a series of spices, including pepper, and is dusted with confectioner's sugar. They look similar to Mexican wedding cookies, but are more flavorful and traditionally served during the holiday season. 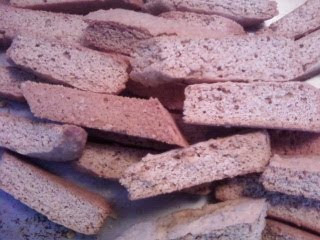 This biscotti is a tried and true recipe. Typically, I do not use molasses as an ingredient, to make sure the batter does not have too much moisture. The core of the cookie is its spicy pepperyness, which is a great foil to a glass of milk, egg nog, or even a steaming cup of coffee. Place butter, sugar, salt, ginger, cinnamon, cardamom and black pepper in a large mixing bowl. It a paddle attachment or hand mixer, cream these ingredients together at a low speed. Blend to a smooth paste. Shape into 2 longs about 2 inches thick. The dough will be sticky and a little difficult to handle. Do not press dough down. Bake for 30-40 minutes, until light golden brown. Let cool slightly, 10-12 minutes, and slice diagonally in 1/2 inch pieces. Place cut side down on sheet to bake an additional 20 minutes until toasted and dry.